“What does our part of the body contribute to the wider body of Christ?” This is a question I suspect many Christians in academia ask themselves. Out of place in the University by virtue of our faith, and out of place in the Church by virtue of our professions, Christian academics and those of us interested in academic questions often find ourselves in between worlds. 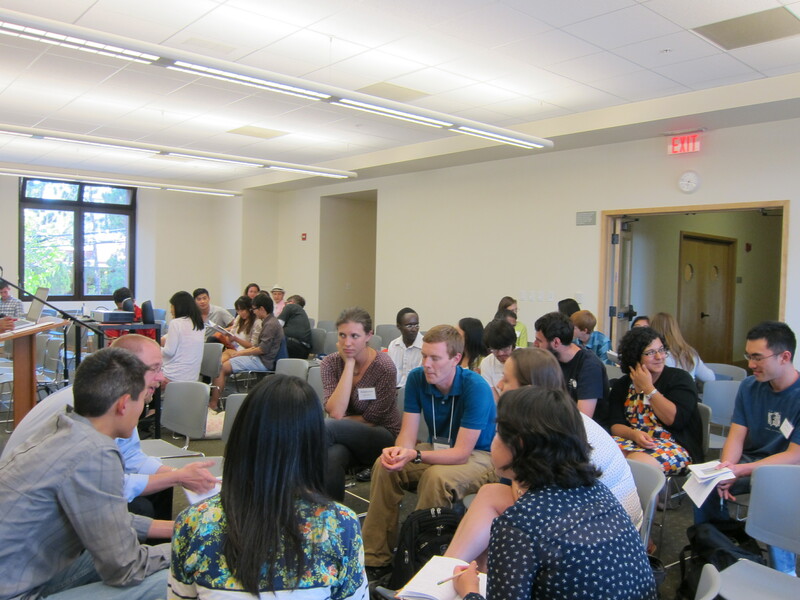 At the second Bay Area Passion Talks Conference held at Berkeley on Aug 23, 2014, Christian grad students found a place where their worlds could come together. Passion Talks are the brainchild of Christian graduate students who gather together each year at our Bay Area Winter Conference. They asked themselves the question, “What is it that we in particular, being Christians who are experts in our respective fields, bring to the church and to the world?” Frustrated with church events that demanded they leave their intellectual lives at home, and professional and academic conferences that demanded they leave their faith at home, they came up with the idea of a conference where they could bring their aChristian faith into the academic picture. Passion Talks are short “TED talk” style talks delivered by Christian graduate students, faculty members and professionals about an aspect of their work, expressly from a Christian perspective. The first Passion Talks conference was held at Stanford in August 2013. Then, sixteen speakers shared their perspectives, and some 50-60 people attended overall. A year later, Passion Talks 2014 built on this, with 20 speakers from Stanford, UC Berkeley, UC Santa Cruz, and San Francisco industry speaking, and 80 registrants attending. Talks were divided into two tracks, broadly covering the topics of Natural Theology, Education, Technology and Society, Health and Environment, and What Makes us Human? For a list of talk titles and videos of talks, see https://passiontalks.wordpress.com/upcoming/schedule. We found a space where we could fulfill our calling. For many of us, Passion Talks was a space where we could do something unique – we could specifically apply our expertise to explore big questions within our fields about the existence of God. Take a look at Will Johnson’s talk on Mathematics, and Elliott Slaughter’s talk on Impossibility Theory. These speakers found that they were able to do what very few others in the Church can do. They could use the concepts and language from within their fields to speak to their colleagues about the things of God. For these speakers, they found their unique place in the body of Christ. We articulated the unique things that knowing Christ brings to our motivation for our work, and to the way in which we do our work. Examples of these talks are Jerome Fang’s talk on how he teaches his classes, and George Korir’s talk on his research in delivering diagnostics to impoverished communities. Still others shared how God has sustained them through the challenges of a life in research. Our community life as Bay Area academics deepened. The grad students of the Bay Area have always gathered annually at our Winter Conference. For the second year running now, Passion Talks have given us a second reason to gather. What we’ve found with Passion Talks is that not only do we have more physical time together, but through giving and listening to each other’s talks, we’re developing a deeper intimacy with each other as we learn about what we all work on, and as we hear each other’s motivations and theological musings. We’re seeing the power of learning from people in disciplines that are outside of our own, and of empathizing with each other’s struggles, and rejoicing in each other’s successes. Passion Talks is also giving birth to new networks of students across campuses. This year, for example, two students across different campuses discovered they were both environmental scientists. They’ve decided to talk more to see how they might bring together their shared passion and expertise. We experienced together the joy of feeling God’s pleasure. For all of us, as we spoke and shared our discoveries and our stories, we experienced the joy of worshipping God with this part of our lives that takes up so much of our time, but is so often stripped of spiritual value. For me, as I listened to talks, watched the logistics team put on meals and run registration, and delivered my own piece, I saw in some small way (or perhaps a not so small way) the truth of “Thy kingdom come” in our lives of study and research. It was a joyous experience, and one that I’m sure gave glory to God. What indeed does the Christian intellectual bring to the wider body of Christ? In the San Francisco Bay Area, we as graduate students, faculty and professionals are still trying to work that out. In Passion Talks though, I think we’re on our way to finding some answers.